I’m honored to be a patient representative of the International Myeloma Foundation (IMF) attending the 59th Annual Meeting of the American Society of Hematology (ASH). This is my 5th time to attend ASH, and I’m continually encouraged by the tremendous amount of myeloma research that is being done. Although myeloma is thought of as a rare cancer, this doesn’t diminish the quest for advancements and a cure. At ASH, you see the detail and passion that goes into the research projects that are underway. This year I will be most focused on updates related to monoclonal antibodies and what’s on the horizon for CAR-T cell therapies. I invite you to follow my tweets and blogs so that I can share my perspective on these two topics throughout the meeting. 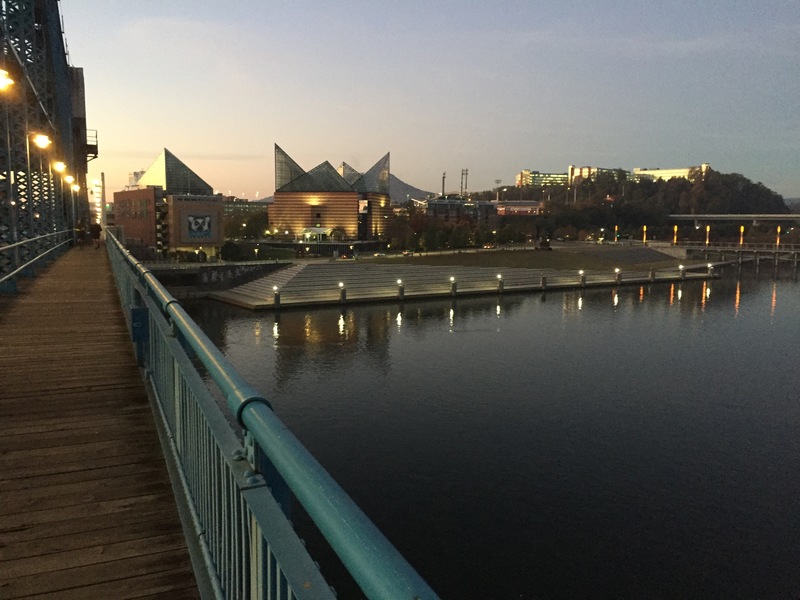 Riverfront image of Chattanooga, Tennessee, taken by Linda Huguelet during one of her morning walks. I live in Chattanooga, Tennessee, which is a beautiful mid-size city just 120 miles north of Atlanta where the ASH meeting is being held. Chattanooga is overflowing with outdoor activities and fabulous scenery. This year, our city was the only city in the world to host 4 Ironman competitions in one year; 2 of which were 70.3 World Championships. For those of you not familiar with Ironman races, a full ironman includes swimming 2.4 miles, biking 112 miles, and finishing with a full marathon of 26.22 miles. Finishing times ranged from 9 hours to over 17 hours. Can you imagine doing this? During one of my morning walks before work, I was passed by multiple runners from various countries who were training for that weekend’s Ironman competition. My first thought was these people are crazy! However, I do admire their physical prowess and dedication to all the training. For me, it’s sometimes a mental struggle: do I get up at 5:30 a.m. so I have time to walk a mere 2 miles before work or do I hit the snooze alarm? My second thought is how do their bodies endure this and what are the long-term consequences? Then I started to think about my journey with myeloma and how there are some similarities to Ironman competitions. When first diagnosed, my mind and body were in shock, much like that of an Ironman competitor diving into the cold river at 7 a.m. and swimming several miles. Luckily, they swim downstream; I think myeloma patients are swimming upstream at first. Getting the disease under control, trying to tolerate treatment, figuring out the terminology and even understanding exactly what the heck myeloma is. The second stint of the Ironman course is biking, which takes the competitors throughout our region and up and down a mountain—covering over 110 miles before it’s all over. Although I’ve never biked up a mountain, I have endured the stem cell transplant process and dealt with the months of recovery after it. My first month of recovery, with my husband constantly by my side, I didn’t venture too far from our apartment near Vanderbilt Medical Center and when I did I carried a small trash bag due to continuous nausea. To me, this was like biking uphill for many miles! As things improved, I was still challenged by fatigue and regaining muscle mass; maybe this is somewhat like biking on flatter terrain – it’s still challenging, but easier than the uphill phase. You can see the light at the end of the tunnel. The last segment for an Ironman competitor is to run 26.2 miles! To me this would seem like a never- ending journey – much like the continuous therapy for many myeloma patients. For me, I’ve been on maintenance or active therapy for 5 of my 7 years with myeloma. And, it appears there will not be a break in my future so that we can keep my myeloma (IgA Lambda) under control. For the runners, I imagine the marathon has its ups and downs as they push to the finish. This is much like the myeloma journey as you try various treatments, experience physical and emotional highs and lows, but ultimately you fight on! Like an Ironman Championship, the ASH Annual Meeting has participants from all over the globe who are battling to win a competition. In this case, the goal is not to defeat other competitors, but to collaborate to defeat blood cancers. They are extremely passionate about finding new and better treatments and ultimately cures for all blood cancers. Thanks to the research that is presented at ASH each year, myeloma patients may someday win the race against myeloma and cross the finish line of needing no more treatments! In the meantime, our marathon continues as we fight myeloma! Please follow my tweets and blogs throughout ASH as I share a patient’s perspective on the meeting and highlight the latest developments that aim to allow us to win this race.